An important part of our project Degeneration has been the research we have collected for each location that we have visited. 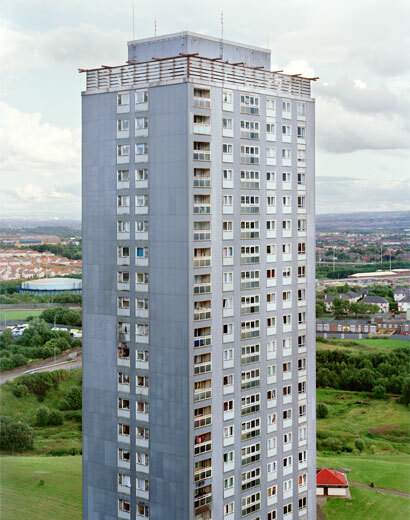 As an example of this I am showing some of our research here of the Red Road Flats in Glasgow. 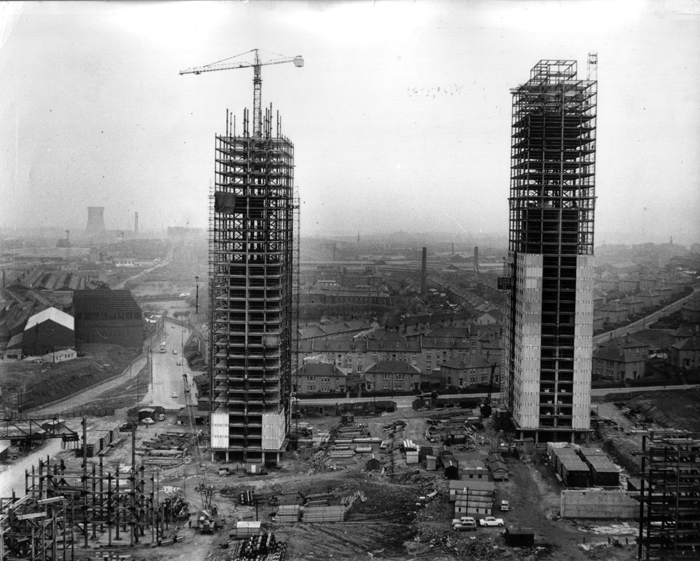 The comprehensive development of central Glasgow areas was the largest of any city in the UK and thousands of tenements were demolished, principally in the 1950’5. In 1947, city councillors visited Marseille to inspect new tower-blocks devised by Le Corbusier. 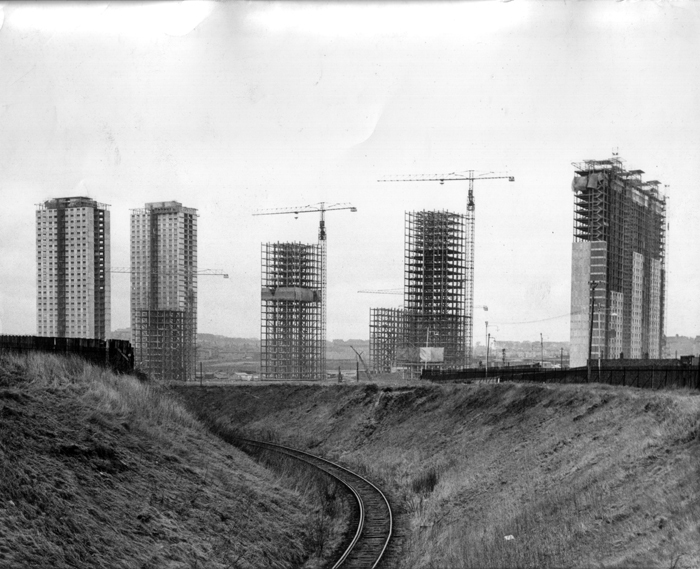 By 1979 Glasgow had more than 300 multi-storey tower blocks. During our visit we meet up with Jonny Howes from redroadflats.org.uk and he kindly gave us some archival images of the Red Road during construction. The images have been supplied by The Glasgow Herald who hold the copyright. 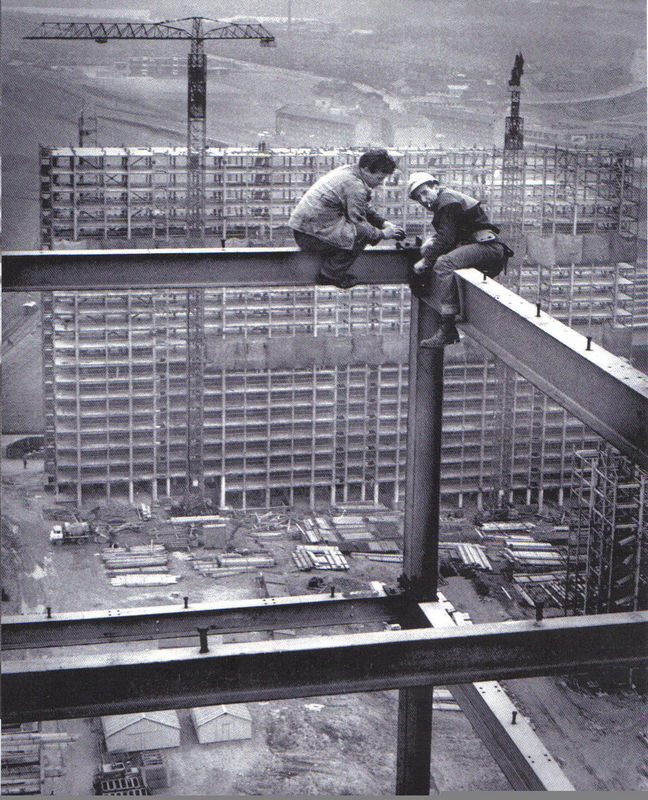 Over the coming years however the Red Road Flats became an area notorious for antisocial crime, ranging from disaffected youths throwing objects from the roofs, to frequent burglaries, often carried out in support of addictions to illegal drugs. Such problems were less severe than those evident in parts of the city such as the nearby low-rise Blackhill estate, long dominated by ruthless crime gangs. But they were able to strike a nerve in the perceptions of non-residents, owing partly to the ‘looming’ ambience of the blocks which in some ways might even be called emblematic. The slab blocks, for example, are not only twenty-five storeys high but also almost 100 metres wide. Now the flats are earmarked to be demolished with two of the blocks already empty and being stripped. Even so some of the residents will be sad to see them go, after all this was their home for many years. I have attached one of several stories that can be found at www.redroadflats.org.uk. John McNally (86) is one local Red Road resident who was amongst the first tenants in the Red Road Flats when they opened in the 1960s. His memories share a time of new beginnings and new hope for the area, giving an important reflection on the current plans for demolition. They provide a valuable insight into life on the estate from its very start. “I watched the flats going up every day on my way to work. I have to say I never thought I’d see them coming down. The land used to be cabbage fields – it was the old Barmulloch Farm. The Red Road was just a path before Springburn was extended. We shifted up here in 1953 when they started knocking the old tenements down. I seen the lads drilling and I came home and said to my wife, ‘They must be going to build there’. In the end it was the sixties before the flats actually went up. It was easy enough to get one of the flats though they were meant to be quite something. Executive flats they called them. There was one Tory – I was always sorry that I never kept this cutting – that said these flats were too good for the working classes. When I was growing up housing conditions were really bad. There were ten of us and we had two rooms and the toilet was in the stairheid. Springburn was known as a respectable working class area – there was no trouble here. There was plenty of industry then with the railways and the cable works and the steel works. When we moved out here it was like the country. The real reason we shifted to Red Road was because it was near our work – the Scottish Gas Board or Provan Works as it was then. I started out as a labourer but ended up as the Purification Foreman. When I started I said, I’ll no stay here long’ and then I ended up there for thirty-six years. My wife worked there as the canteen cook. When we first moved in to Red Road the spirit of the old tenements was still here. People talked to each other, the women were out there on a Friday night to do the cleaning, they’d do the windies before we’d go down to the pub. But then everything changed and they got a bad name. What do they call them now? The notorious Red Road flats’? Apparently at one time there were 600 flats that they couldn’t rent. But I love the flats. The first day I moved in I was amazed at looking down and seeing birds flying –twenty-seven storeys up. I really like the view. On a clear day you can see the hills of Arran. You get great sunsets and sunrises. I’ve never had any bother in the flats. The one thing is I don’t know my neighbours now. I’d say it started to change quite a few years back. I lost my wife in 1999 and even then she’d know most of them. Now they’re mostly refugees and asylum seekers. We’ve got every nationality living here now. We were Irish and we were asylum seekers at one time too, some of them have had a terrible time. Red Road Flats. 2010. Richard Chivers. 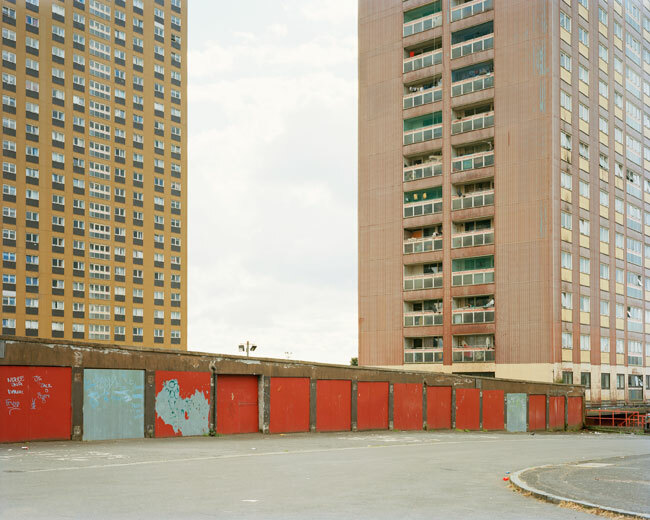 The Red Road Flats 2010. Alex Currie.